Have fun making Halloween cookie recipes when you banish the goblins and scaredy cats - and use these time-saving tips instead. Here’s a simple baking tip: use an easy cookie recipe and add orange and black cookie decorations. 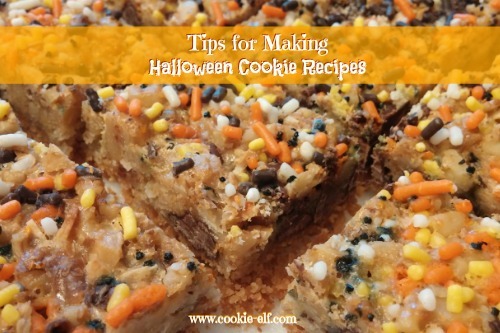 For instance, make Chocolate Chip Bar Cookies and sprinkle the top with Halloween cookie sprinkles before you pop the pan in the oven. Presto – you have a “new” Halloween recipe! Use plastic wrap to package individual Halloween Rice Krispie Treats and Monster Cookies for bake sales and parties, or pop them in care packages or gift baskets. Bonus tip: use colored plastic wrap or package jumbo cookies in individual gift bags. They're not just for October! Halloween colors coincide with the colors of fall. That’s why you can use orange, yellow, red, brown, and even black colors in cookies and cookie decorations throughout September, October, and November. And don’t forget shapes: pumpkins are popular well into Thanksgiving and beyond. Many families include candy corn on their Thanksgiving tables. You could offer similar cookie recipes during your Thanksgiving celebration, too, such as Candy Corn Rice Krisipie Treats for the kids and Pumpkin Pie Bars instead of baking a fussy pie crust. Easy Halloween Rice Krispie Treats: jack-o-lantern look-alikes! Halloween Cookie Pizza: fun and easy for kids!